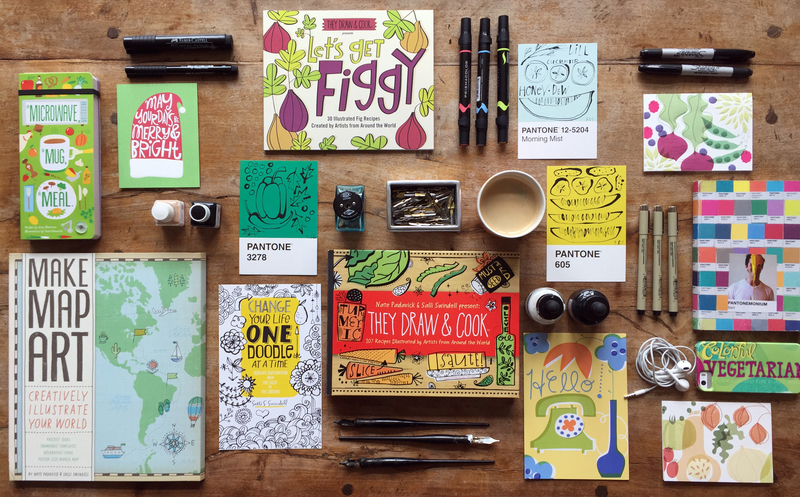 Are you a designer, illustrator or creative doodler? Have you wondered how you could turn your talents into a business? Whether you are just thinking about becoming a freelance illustrator or have been doing it for years this class has so much to offer. This class was recorded on August 17-19, 2015. Each session lasts one hour. You may purchase the class to watch at anytime! TDAT founders Salli Swindell and Nate Padavick have a combined 50 years of freelance illustration experience and have been fortunate to work on exciting and rewarding projects with many incredible clients such as Chronicle Books, American Greetings, Quarry Books, and The Wall Street Journal, to name a few. They have teamed up with Modern Thrive to offer a three-day workshop to help you create a plan for leveraging your creative talents into a successful freelance business. Find what’s unique about your style. Identify who your target audience is. Leverage your style in a way that reaches your niche. How to creatively leverage your work to build an online community that supports the growth of your business. New ways to leverage your online portfolio to create conversation around your work in a way that helps you attract new clients. How to leverage your online platforms to attract new clients. How to start building your client followings. An inside look at how experienced designers negotiate and close new clients. Salli and Nate asked freelance illustrators for one piece of advice they'd like to share with others. Click here to read 20 fabulous responses. Salli and Nate asked 20 well-respected art directors from the publishing and merchandising worlds one question: Why would you hire an illustrator for a second time? Click here to read their insightful answers.